When she was 19 years old, Nury Chavarría came to this country with her father and her brother seeking refuge from violence and civil unrest in her native Guatemala. The two men were granted asylum status, but for reasons that are unclear Nury was not. Nevertheless, afraid to go back, she remained in the US for 24 years. While here she began raising a family of four children, and for the past 15 years worked a steady job as a housekeeper. She paid her taxes and has had no arrests. She is just the type of person one should want as a member of society. In 1998 Nury was issued a voluntary deportation order but remained in the US because she did not want to abandon her children. In 1999 she was given a final order for deportation, but stayed for the same reason. 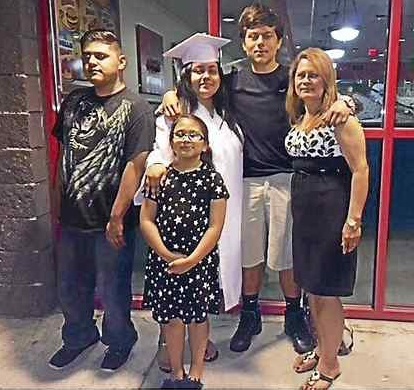 Since 2011 she has checked her status annually with ICE and each time was allowed to stay to continue raising her children. But this year was different. Nury then sought sanctuary in the church of Pastor Hector Otero, a Pentecostal minister in Fair Haven. As of this writing her situation remains uncertain. ICE considers her a fugitive, and no one is confident she can live in the church indefinitely. In the meantime she has received support from her state’s two senators and from Governor Dannel P. Malloy, who visited the family at the church on the day Nury was supposed to leave. But this is where we are right now. The Party of “Family Values” is now in the business of separating families. Perhaps family values apply only if the families are white. And if you haven’t been born yet, so much the better. I can’t really say. I am only trying to make sense of the data in front of me, wondering why “family values” Christians say nothing about ripping apart Latino families while real Christians like Pastor Otero take the risks. Wasn’t the Jesus whom “family values” Christians claim to worship a castigator of hypocrites? Think of what this means. When Donald Trump says he is only going after the “really bad dudes” to deport them, then persecutes people like the Chavarría family, the clear message is that all Latinos are “really bad dudes.” Donald Trump ran on a program of making ethnic hatred acceptable, and this country allowed him to succeed. The Republican agenda is one of systematic cruelty towards the most vulnerable people in our society. The Republican Party has been hell-bent on pushing version after version of a “health care” bill that has nothing to do with health care but only how many services they can cut from poor people to finance a tax cut for the rich. They even stigmatize Medicaid as a handout to people who are too lazy to work for it, and they can hardly wait to dismantle it. Most Medicaid recipients do in fact work, and those who cannot are the frailest and sickest people in the country. This includes most of our nursing home population, who are already suffering greatly from widespread understaffing. The Medicaid cutters will never tell you what will happen once they shrink the program to the point of cutting staff and services even further, compounding patient neglect and injury. But their consciences are clear, because they believe that government should not be in the business of actually helping people. Much is being said today about a political party’s “message.” The Republican/libertarian message is clear: it is everyone for oneself. You’re a man, you don’t use prenatal care, then you shouldn’t have to pay for it. And kill the individual mandate for health insurance, even though it’s necessary to keep premiums and deductibles affordable for everyone. Also, you want a combat-grade firearm? Then you should be able to get one (or many), regardless of how the ready availability of such weapons may put society at risk. Ideally no one should have to pay for anything one doesn’t use oneself, and taxes are intrinsically evil even though a functioning society depends on them. If you can’t afford the necessities then too bad; you should find a better job - even if no job within reach could even come close to paying for your health care once the Affordable Care Act is repealed. We are not our brother or sister’s keeper. Selfishness is a virtue - just ask Ayn Rand. I, me, mine: the individual before everything. The Democratic Party has been criticized for lacking a clear message. But it should not be difficult to find a positive message as an alternative to the Republicans’ undermining of human values. What the Democratic message should be is best expressed by these words attributed to Benjamin Franklin upon signing the Declaration of Independence: “We must, indeed, all hang together, or assuredly we shall all hang separately.” There is a social contract. This means the sacrifice of some individual freedom for the sake of the common good. Because if Jewish and Christian values really are a part of this country’s tradition, then we are responsible for each other. No person left behind. However, Democrats are afraid to articulate such a message because Republicans have successfully defined a false choice between unrestricted individual freedom and communism. They invoke Ayn Rand to suggest that any regulation at all puts us on the path to Soviet-style collectivism. Meanwhile, especially in red states, neighborhoods suffering the effects of industrial pollution have been experiencing poisoned food and water supplies and higher cancer rates. The effects of global warming are also becoming more difficult to ignore. But it’s hard to speak out for social responsibility when you’re scared of being called a communist. Both individualism and collectivism are extremes to be avoided. The Republican Party has been tilting increasingly towards unbridled individualism. A Democratic response should be the assertion of a necessary balance between these two poles. Yes, people are responsible for their own lives and livelihoods. Government cannot do everything. But when we are the only industrialized nation without universal health care, that should make us think. It is not a “right” or a “freedom” to die of cancer because it can’t be treated in an emergency room, the last resort for the uninsured. Taking health care away from some people just to give others more money that they don’t need is not only inhumane; it is criminal. We stand for a society that welcomes diversity as a strength and does not exploit hatred to divide and conquer. We stand for the social contract, based on the principle that a society is more than just a collection of individuals. We stand for the preservation of individual freedom modified by the necessity of working for the common good, with full realization of the delicate balance. We stand for promoting the well-being of every member of our society. We are responsible for each other. We have a duty to each other, and not just to ourselves. Above all we should not be afraid to present this message, because it is time to show a clear and positive alternative to what we have allowed this country to become. (1) Kathleen McWilliams and Sandra Gomez-Aceves, “Norwalk Woman Facing Deportation Seeks Refuge In New Haven Church,” Hartford Courant, July 20, 2017. (2) Russell Blair, “ICE Says Woman Who Fled to New Haven Church Is a Fugitive,” Hartford Courant, July 21, 2017. (3) Mary O’Leary, “Connecticut Woman Who Was to Be Deported Takes Refuge in New Haven Church,” New Haven Register, July 20, 2017.